Wetland wildlife will benefit from the work of the Godmanchester Beaver, Cub, Scout and Explorer groups at Paxton Pits Nature Reserve. 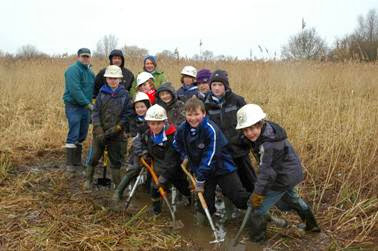 The massed group of 40 youngsters and 25 parents and leaders dug a series of mini-ditches to allow the waters of the Reserve's Cloudy Pond to spill over into the surrounding meadow. The mini-ditches will make the area of sedge and reed adjacent to the pond much wetter throughout the year, increasing the feeding opportunities for marshland birds such as moorhen, snipe and water rail. The tasks were organised by The Friends of Paxton Pits and Huntingdonshire District Council Countryside Services Rangers, and supported by Bardon Aggregates, which operates the quarry to the north of the Reserve. "The youngsters got through an amazing amount of work in very muddy contitions. Their efforts will make a big difference to the wildlife in this corner of the Reserve. Also, the area is easily viewed from the Ouse Valley Way, so they can return and watch the results of their project." "The children threw themselves into the task, in some cases literally, to judge by the state of their clothes! They were definitely in their element - mud, water and teams competing to dig the longest ditch. I think the parents rather enjoyed it too"